Text: From The Stamps of Jammu and Kashmir Part II by D.P. Masson, pp 24. The Indian Postcard was used in both Provinces from about August 1883. A State postcard was introduced about June 1887, presumably to save the cost of Indian postange on those used within the State. [In Masson’s footnote: The catalogues give the State postcard period as 1883-90. I am confident the correct dates are 1887-94.] They were printed in red, with shades of rose and orange, on various stout wove and laid papers, cut to the size of 5.50 ~ 5.75'' in length by 3.5 ~ 4.0'' in height. At first the paper was cut roughly by hand, but latterly the cutting appears, as a rule, to have been done by a guillotine machine. They were also printed in black, for Service use. But I have never seen a Service card used; if used at all, it must have been most sparingly, for when the Department was taken over by the Indian Post Office only a very rupees worth of Service cards were found in the State Treasury. 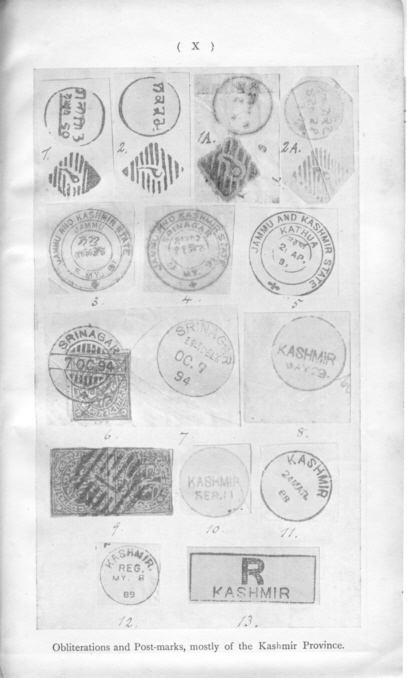 In the British Post Office at Srinagar the combined date stamp and barred obliterator was continued until about July 1880, when a new postmark (figure X-8) was introduced, it having smaller letters than the previous one and also a new separate obliterator having a large letter L within a circle of diminishing lines (figure X-9). This again was superseded, in April 1884, by one having still smaller letters (figure X-10), the L-obliterator being continued as before. In July 1887 yet another date stamp was introduced have the word “Kashmir” in circular form round the top (figure X-11) and was used as before with the separate L-obliterator as before. A month or two later an oblong stamp bearing a large R and the word “Kashmir” was added on registered letters (figure X-13). I know of no further changes while Kashmir stamps were in use. 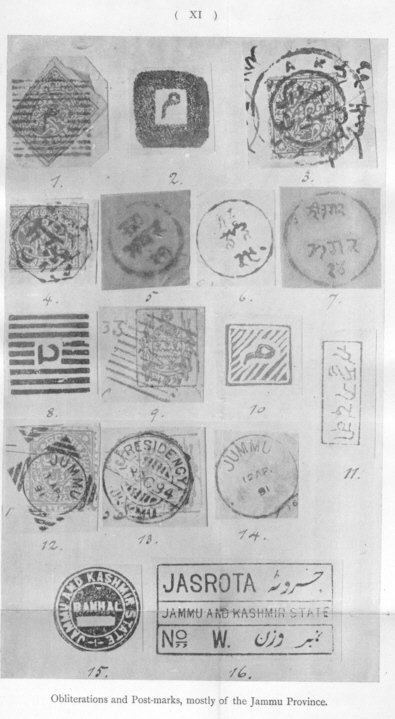 In addition to the above mentioned despatching marks for letters posted at the Srinagar Post Office, there were also delivery stamps; but these are of little consequence because postage on incoming letters was paid in cash, and no State stamps were as a rule affixed to them. At the British Post Office at Leh (Ladākh) the old postmark was adhered to throughout, but the barred obliterator was soon abandoned and the date stamp only used. An oblong stamp for registered letters, like the Srinagar one, was introduced here also. At the State office [in Leh] the old large seal was continued, black being substituted for the brick-colour obliteration, at at Srinagar. No doubt a circle and double-triangle stamp was also supplied here, but I have been unable to identify one amongst those preserved at Jammu. The barred obliterator described above was used at Jammu until about the middle of 1887. Very rarely, in 1878 and 1879, two special obliterators were used in place of the two standard ones. The first (figure XI-3) was composed of two circles and bears the words dāk Jammu ~ ‘post of Jammu’ between the circles, and the Persian inscription mohr dāk Jammu ~ ‘seal of the post of Jammu’ within the inner circle. The other obliterator was an octagonal one having a Persian inscription which I have not been able to decipher (figure XI-4). In May 1887, a new form of obliteration was introduced, consisting as before of a square of bars having, however, only nine bars instead of twelve (figure XI-8). The centre contained a character distinguishing the various post offices. About the same time a new circular postmark appear, like the old ones but much larger (figure XI-7), probably representing a new post office in the districts. [Copyist’s note: Masson is here referring to the Srinagar Circle, his example being in fact very legible as these come.] There were also obliterators having ten full bars (figure XI-9). The use of the new barred obliterators soon became universal, until they were supplemented and finally superseded by the well-known circle postmarks used as obliterators as mentioned. At some of the subordinate post offices, obliterators without postmarks were used, from January 1886, contemporaneously with the circle and double-triangle and the barred obliterators (figure XI-10). Stamps like figure XI-11 are often met with on the envelopes. The one illustrated is mahsūl bākhī ~ ‘more duty,’ and corresponding to our postage due. There were similar stamps for ‘bearing,’ ‘too late’ and other purposes until until later these were superseded by stamps bearing these inscriptions in both English and Persian characters. The latest forms of obliteration at Jammu are shown in figures XI-12 to XI-14. And figure XI-15 shows a form of obliteration, leaving the lettering uninked, which was used occasionally at various post offices at the time. I cannot but think these may have been intended for sealing the letter bags, though they bore a space for dates; but, as I have said, they were frequently used to obliterate stamps and also used as postmarks. The Jasrota office stamp (figure XI-16) shows the form used latterly in listing registered articles. There were several somewhat similar ones, all in the vernacular character, used earlier.